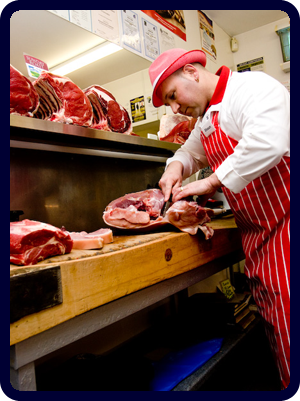 Although called various different names the shop has been a butchers serving the community of Mirfield since 1850. Shaun has worked in the shop since 1991 and has built up a good relationship with the Mirfield Community by playing an active role in the town including sponsoring Mirfield Parish Cricket club. Thanks to the pride that Shaun takes in his produce by only using the best locally sourced meat and ingredients for his award winning pies and sausages Shaun has been nominated as a Local Food Hero every year since 2006 and by using locally sourced meat he is able to minimise his carbon footprint. As well as maintaining the highest food standards Shaun takes pride in the shop itself and has recently been awarded a 5 star Food Hygiene Certificate, the highest award achievable and the Kirklees Environmental Health "Scores on the Doors" are clearly displayed in store. 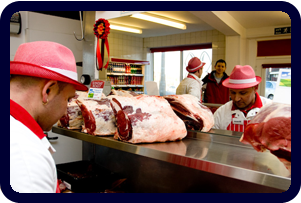 Shaun Fairweather is a member of the National Federation Of Meat and Food Traders.